In many ways, a kind and far sighted man of the 19th century rather than the ogre portrayed by some in the 21st century. Cecil Rhodes ranks alongside some of the great British patriots of his time – such as Prime Minister Benjamin Disraeli and General Gordon of Khartoum – who were proud of their nation and what they felt it had to offer the world – and were not afraid of saying so. Of course it is popular today to denigrate Rhodes along with Rhodesia, however, in the context of his time, it was he who had the vision and energy to secure this part of central Africa for the British Empire thus saving it from the certainty of falling into the hands of another, probably less benign, colonial power. It is necessary to transport one’s self back to the late 19th century to understand the context of the times – not of the nuclear missile race but the acquisition of colonies. Today’s standards of morality cannot, and should not, be applied to a quite different time and environment. And nor should those living now be so arrogant as to assume that today’s morality, in all its various facets, is necessarily better, or worse, than that of another age. One has only to imagine how today’s widely accepted truths may be viewed in another hundred years time. Was Rhodes without blemish? – of course not! Politically Rhodes was a supporter of the British Liberal Party and a strong proponent of Irish Home Rule (ie self government at a time when Ireland was a part of the United Kingdom). As a politician he had both supporters and detractors. Did he exploit his workers? Well, think of famous men like Brunel and his use of Irish navvy labour to build the railways etc. So, no more than most other entrepreneurs of his time; in fact African workers were keen to work for him as he paid well above the norm. He considered the black tribesmen, with whom he came into contact, as children and felt that they needed to be looked after as such. Some today might consider this a flaw but such a view would ascribe to these tribes a level of development similar to that which they have reached in the 21st century. This was simply not the case 125 years ago. Rhodes even sought to safeguard land for Africans by copying the American and Canadian practice of reserving land for their exclusive use to prevent everything being bought up by the more advanced Europeans. So, a fairer view would be to acknowledge that for his time he was a caring and thoughtful ruler. When he died just short of his 49th birthday he was widely mourned even by the tribesmen of Rhodesia who, despite their differences, saw in him a fair and just leader. They turned up in large numbers at his funeral in the Matopos Hills near Bulawayo and, possibly uniquely for a white man, gave him their royal salute: Bayete! (or Hayete!). Bearing in mind he lived and operated in the very different world of the 19th century it would no doubt surprise many of his present day detractors that he is on record as stating: “I could never accept the position that we should disqualify a human being on account of his colour.” (Cecil Rhodes and his Time by AP Davidson (2003) p 255). And let no one forget the great legacy he left to the English speaking world in the form of the Rhodes Scholarships which so long after his death still provide 83 places each year to students from around the world to study for three years at the oldest university in the English speaking world, which Rhodes himself had attended: Oxford. Rhodes’s vision in founding the Scholarships was to develop outstanding leaders who would be motivated to “esteem the performance of public duties as their highest aim”, and to promote international understanding and peace. Only five years after his death, the trustees that he had chosen selected the first black Rhodes Scholar. His dictum of “Equal rights for every civilized man” was a guiding principle in the future government of Rhodesia. * Like the proverbial doctor, the handwriting of Cecil Rhodes is not always easy to read! 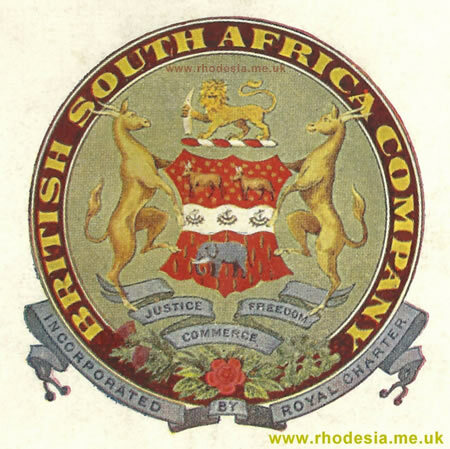 These principles may be seen incorporated in various of Rhodesia’s constitutions such as that adopted upon Independence in 1965. RHODES – The Man. BY ONE WHO KNEW HIM. 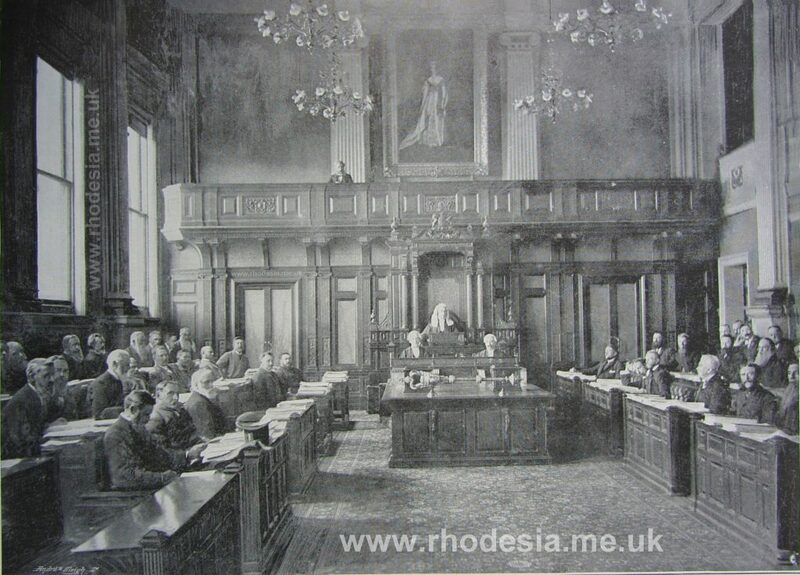 Rhodesians of today know of Rhodes as the statesman, the Empire-builder and the founder of a nation which he, when still that nation was in its infancy, prophesied with far-seeing vision, would have a great and steadily-growing influence on destiny in Africa. But we old pioneers of the generation that knew Rhodes best, remember him as the man and the friend. And the memories we have of his little peculiarities, his kindness in small things, his genius in great, keep him enshrined in our hearts. At no time was the Chief happier than in the days he spent in Rhodesia, and particularly in that part of the wild and rugged Matopos where he now lies buried. He delighted in being away from the trammels of civilisation, and his favourite attire was an old coat, white flannel trousers, and always that famous hat, wide brimmed, dented circularwise at the top – a typically South African hat. If you have a good idea, then all you have to do for success is to stick to that idea, was one of his favourite dictums. And I remember that he was always at extreme pains to convince himself that he was right before he attempted to impress an idea on other people. He would argue both sides of the case to himself, or else in that high-pitched voice of his would adopt the attitude that one of those riding with him was arguing the case against him. Rhodes’s kindness of heart earned him real affection. I remember once a trooper who ate too much melon and gained a terrible stomachache thereby. 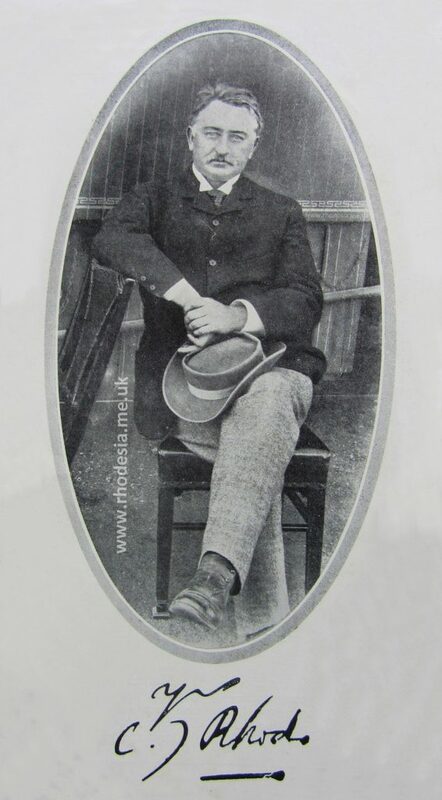 Rhodes had the sufferer put to bed in his own bed that night and slept himself on a saddle cloth under a wagon and covered by a greatcoat – this at a time when he was the outstanding man in Africa. Then there was a man he found bathing in a pool. He asked him to dinner, and when the bather hesitated said, “I believe it is because you haven’t a shirt. Never mind – come along, and I’ll lend you one of mine.” Small things, true, but we remember such with gratitude and affection, because they came straight from the heart. We remember him, too, as one extraordinarily just to the natives, and one who knew that few things leave greater impression on them than self-confidence. He showed both qualities in the famous indaba in the Matopos not far from where he now lies buried – a desire to show justice to those who looked upon him as a father and a calm, assured confidence that enabled him to go with but one or two companions to meet the chiefs and headmen of the fighting Matabele. Some of us, some of the few, who grow steadily less, who could claim to have been friends of Rhodes, were present this year when the twenty-fifth anniversary of his death was marked by an impressive service on the wind-swept, sun-warmed kopje – “golden at dawn, at sunset bathed in fire” – where the Chief sleeps the long years through. A nation’s shrine, this, and worthy of a pilgrimage from all who pass our borders. 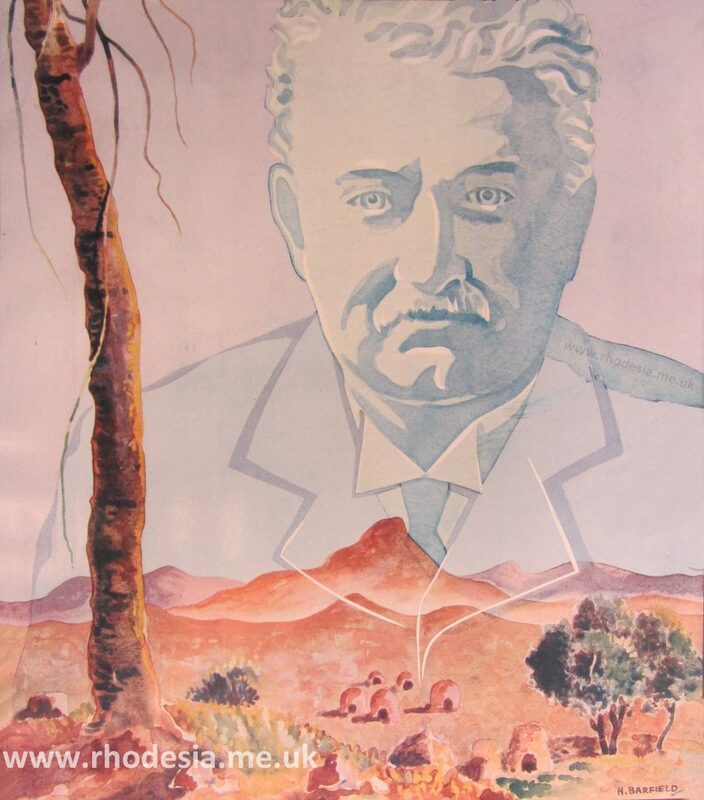 The Spirit of Rhodesia – The Founder: Cecil John Rhodes after a painting by H Barfield. From The Burial, a poem by Rudyard Kipling. Major FREDERICK RUSSELL BURNHAM D.S.O. “And now what can I write of Rhodes? Many volumes have already been printed and there will be more to follow, long after those of us who knew him have passed away. I feel it is a great presumption on my part to write anything; yet, as I recall the daily happenings of my life in Africa, its hopes, fears, and ideals, the spirit of Rhodes, like the strong breeze across the high veldt, is ever present though unseen. It would be hard indeed to describe all that I believe to be essential to a true leader or to analyse what attracts other men to him. A frontiersman like myself is perhaps especially keen to read and study the inner mind and find out the sources of the strength or weakness of his leader. Perhaps any one who has always been obliged to make his own decisions swiftly and accurately may demand that ability to be paramount in one whom he is willing to follow. In all my dealings with Rhodes, he stood this test, but it was only one of his many superior qualities. It is not enough to say, although it is true, that Rhodes was unusually constructive and practical and that he was clearly dominated by a high and kindly philosophy, for that description could be fitted to lesser men. Just where his remarkable superiority lay would be hard to determine. In his personal tastes and habits he was a model of simplicity, yet his mentality was exceedingly complex. He had an extraordinary combination of romantic vision and hard common sense; the indomitable force of the virile Norseman tempered by the thoughtful humanity of the Oxford don and infused with the subtlety of a born master of statecraft. In some with whom he came in contact he roused an immediate and singularly violent antipathy, while in others he lighted such a fire of enthusiasm that they fairly burned to do or die for any cause he might espouse. The word “superman” best describes him, for the great qualities he possessed seemed irradiated and strengthened by the very essence of the man. His inspiration could best be understood by meeting his eye or hearing his voice – a purely personal illumination. Rhodes had the courage of a lion. He hated bloodshed. He did not believe in lordship over subject races, but admitted that backward races should be guarded, conserved, developed. Scrupulous justice and unlimited mercy were shown in all his adjudications. He was never misled by slogans, nor did he believe that the Voice of the People is the Voice of God. He recognized too well the crimes that have been committed by popular vote, from the Crucifixion to the present day. He did believe that the civilization of the English-speaking world was to become the pivotal point around which all peaceful nations might safely rally. Under the administration of Rhodes, there were the fewest laws, the widest freedom, the least crime, and the truest justice I have ever seen in any part of the world. Though the colonists were high-spirited men, used to arms and impatient of control, and although money was plentiful and valuables were inviting to the pilferer, yet crime was almost unknown; doors were left unlocked and the jails were empty. The nearest approach I have known to the Rhodesian condition of things was in the early days of the Klondike rush, when tons of gold were carried down the creeks and shipped without guard, and cabins and tents were wide open. Some unseen spirit of good government must have ruled Alaska during those first days; some exquisite Ariel of Law, as subtle and intangible as the bouquet of the vintage of ’84. In Alaska, we said, “It is in the air – this marvellous, pure, still Arctic air!” In Africa, all men would have agreed that it lay in the magnetic and forceful personality of Cecil Rhodes. The above is an extract from Major Burnham’s book: SCOUTING ON TWO CONTINENTS first published in 1926.
Who was Frederick Russell Burnham? 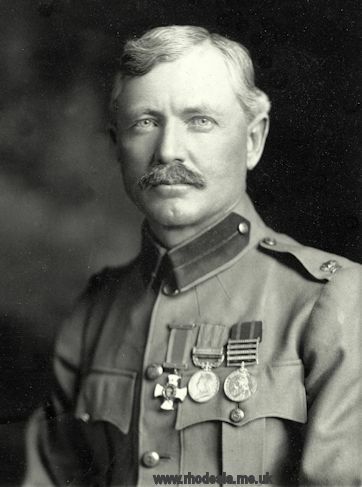 In 1904, Frederick Russell Burnham was to be awarded the Victoria Cross for his valour in Southern Africa, but Burnham declined rather than renounce his U.S. citizenship—a requirement at the time. Instead, he was awarded the British Army’s second highest commendation, the Distinguished Service Order. “I have seldom been as much taken with a narrative” – Rear Admiral William. S. Sims, U.S.N. Frederick Russell Burnham: Explorer, discoverer, cowboy, and Scout. Native American, he served as Chief of Scouts in the Boer War, an intimate friend of Lord Baden-Powell. It was on some of his exploits demanding great courage, alertness, skill in surmounting the perils of the out-of-doors, that the founder of Scouting based some of the activities of the Boy Scout program. As an honorary Scout of the Boy Scouts of America, he has served as an inspiration to the youth of the Nation and is the embodiment of the qualities of the ideal Scout. – 27th Annual Report of the Boy Scouts of America (1936). The Cape Legislative Assembly in session. The House of Assembly, Cape Colony, c 1895.
seated on the government front bench – second from the end opposite the mace. Click on the picture and then again for a closer view. A Great Man of his Time. – Sir Thomas E. Fuller K.C.M.G. writing in 1910 shortly after retiring as the Cape Colony’s High Commissioner in London. Sir Thomas Fuller was a long standing member of the Progressive Party. He was Cecil Rhodes neighbour and sat with him in the Cape Parliament for some 20 years.